Join us Saturday October 26 from 11:00-4:00 in the parking lot of 708 N. Ashley Ridge Loop Shreveport for Keller WIlliams 6th Annual Oktoberfest! There will be so many things going on for you and your family to enjoy. It is $3.00 for adults and $1.00 for children to attend, and all money collected will be donated to Steve Lowe and his family to help them through this very tough time. The events at KW Oktoberfest will surely keep you busy. There will be a Raffle going on for an IPad 2, the tickets are $2.00 or 3 for $5.00. You don’t want to miss out on this!! We will also be having a cake walk, a dunking booth, space walk, and a silent auction. We have been collecting things for the silent auction and we have some great things to sell! We are also doing a team member Chili cook off! You must provide your own table and all decorations, however may the best pot win!! Prizes will be given for the best showmanship. Entry fee for the cook off is $100.00 per team. For those of you wondering about Steve, here is a little more info on his situation. January of 2011 Steve underwent surgery for a brain tumor, this Summer it was found out that Steve’s tumor had returned and they found an additional one. Steve had his second brain surgery on June 4th with his family by his side. Keller Williams just wants to help Steve and his family with their financial burden and send as much love as we can. We are praying for a smooth healing and keeping our focus in our faith. Don’t miss this wonderful event and this opportunity to give back in your community! Can’t wait to see you there!!! Starting September 30th I am starting a 66 day lead generation challenge. I will be working Monday through Saturday making 15 contacts (talked to someone about real estate) a day. My reward if I make an extra 5 contacts a day is I get Saturday off, if I only make 15 calls a day I will be working Saturday. The 66 days will end December 30th. Gary Keller says in the “One Thing” It takes 66 days to create a habit. By the end of the year I will have created the habit of lead generating. What a great way to finish off the year creating a habit that will generate you more money. After the 990 contacts have been made at the end of the year I will be purchasing the largest signs ever for my real estate business. If I do not make the 990 contacts I will make a $1500 check out to a realtor in my market who needs some love. A competitor that would be a struggle to give money to. Out of respect, the realtor will stay nameless. To me this means drop the weights that are keeping me back…distractions, procrastination, self pity and comparing myself(we all have a different race). To keep focus on Jesus and the goals and dreams he has given to me. To keep the Faith on the outcome of the race by staying consistent, persistent and steady with my actions (lead generating). Now if my door is locked don’t get mad just know I’m finishing the race God has set before me. Does Waiting to Buy a Home Help or Hurt? Wondering about what’s going on right now in the market? Well you have come to the right place. Holloway Home Group is happy to provide you with that information. Shreveport market is going well at the moment. Let Holloway help you get your home sold in this market for 2013, or in the future when it is time to sell. Currently, there are 2437 homes for sale in NWLA. These are homes for sale in Shreveport and surrounding areas. Last month 380 homes actually sold in Shreveport and surrounding areas. That’s a 6.4 month supply of homes if no more homes come on the market. Last month 668 homes came on the market in Shreveport and surrounding areas. Currently, there are 185 homes above $400,000 for sale in NWLA. Last month 14 homes actually sold. That’s a 13 month supply of homes if no more homes come on the market. Last month 37 homes came on the market. Currently, there are 478 homes priced between $250,001 and $400,000 for sale in NWLA. Last month 67 homes actually sold. That’s a 7.1 month supply of homes if no more homes come on the market. Last month 132 homes came on the market. Currently, there are 767 homes priced between $150,001 and $250,000 for sale in NWLA. Last month 149 homes actually sold. That’s a 5.1 month supply of homes if no more homes come on the market. Last month 197 homes came on the market. Currently, there are 1008 homes priced under $150,000 for sale in NWLA. Last month 150 homes actually sold. That’s a 6.7 month supply of homes if no more homes come on the market. Last month 303 homes came on the market. Search Shreveport Homes for sale, or 2013 Market Statistics. Holloway wants to help! Holloway Home Group just sold a beautiful Shreve Island home. This Shreve Island home only made it on the market for 1 month! A Shreveport home like this just couldn’t be passed up. WIth much help this transaction was quick and easy. Cherine Garrett with Cobalt Mortgage made it happen in just 11 days! Wow, how awesome is that!! We also appreciate Geoffrey Guy for referring this family to Holloway Home Group. There were many features about this home that made it irresistible. For instance in the backyard there is a wonderful Koi pond that is just so relaxing. The view from the kitchen overlooks the backyard and it is just breathtaking. The yard is large both front and back, and there is a 2 car covered garage. This home also offers an attached workshop with ample room for building, or storage. The closing for this home went very well. It is great to work with such wonderful buyers and seller. Search Shreveport homes for sale and let Holloway find your way! Bossier City Home Taken off the Market!! We are so happy to announce another Bossier City home sold. Looks like our Buyer’s Agent Bobbie Hebeisen is on a major roll with Holloway Home Group. Huge congratulations to Mrs. Bobbie, we are so proud! This sell was a breeze for Bobbie and her buyers thanks to a VA loan from Barksdale Federal Credit Union, and United Title on Airline. In this case, the seller paid closing cost and left the fridge for our buyers. This property is Located in Greenacres Subdivision, and near Apollo Schools. It has 4 bedrooms and 3 baths, very convenient for this family of 5. Congratulations to this happy family as well!Let Holloway help you find your new home! Search Homes for sale in Bossier City. Holloway Home Group just adopted a new home for sale in Shreveport. This 3575 square foot home is for sale for $265,000. It is located at 3935 Ann Lovelace on 1 acre of land. This home has a huge yard thats just gorgeous. With 4 bedrooms, and 2.5 baths, there is plenty of room for your family to be cozy and comfortable. This home also qualifies for rural development 100% financing! This Timberline Subdivision home has 1 acre of land so even though it is close to main highways and many stores, there is still that sense of peace and quiet. It is great for kids or pets to have a nice large yard. Plenty of room for swing set, pool, or trampoline in the backyard of this Shreveport home for sale. This particular Shreveport home for sale is near the Pines Rd. area. There are many restaurants, stores, and activities close by. Nicky’s mexican restaurant is near, also Becca’s Steak & Seafood, both very enjoyable places. One of the best features for the children, or even just a family day is Splash Kingdom is right around the corner. Search Shreveport Homes for Sale and let us know how we can help! 520 Antietam has been SOLD!! Call the Holloway Home Group at 318.572.6551 or email us at hollowayhomegroup@gmail.com! Search for South Bossier Homes for Sale!! Here we are once more to congratulate Bobbie Hebeisen with Holloway Home Group for a sale after only 64 days on the market! The Gardens of Southgate just made a great new neighbor with this family. 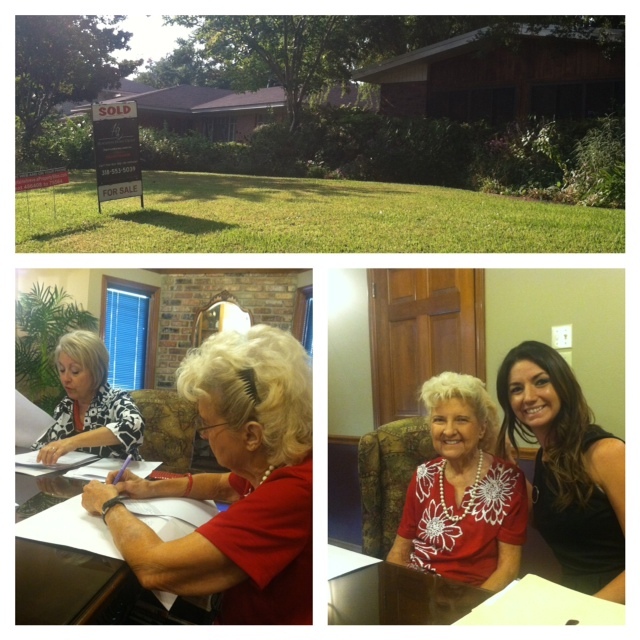 Bobbie is Holloway Home Groups buyers agent and she has done a wonderful job getting this home sold smoothly. The loan went well, it happened to be a VA loan with 100% financing thanks to Barksdale Federal Credit Union. Greening Home Inspections came out and performed the home inspection, which went extremely well. The Gardens of Southgate is a wonderful gated community near these award winning South Bossier schools, Curtis Elementary, Elm Grove Middle School, and Parkway High School. This particular home has a fully fenced in back yard, and a covered back patio great for relaxation. The main road near The Gardens of Southgate is Barksdale Blvd. Conveniently on Barksdale there are plenty of food selections, some shopping, and banks. This closing took place on Aug 30, 2013, and it won’t be long until the lucky family can move in. This house is 2030 square feet, with 4 bedrooms and 3 baths. So many features make this house nearly perfect, and who wouldn’t want that? It was built in 2009 and also has a 2 car garage. Once again congrats to Bobbie Hebeisen and the Holloway Home Group! Search Homes for sale in South Bossier!